With more than 240 stores open in 18 states (and counting! ), Bruster's Real Ice Cream is the fresh opportunity you've been looking for. For nearly two decades, we've been the industry leader when it comes to REAL ice cream – nothing fake and nothing old. Our franchisees are successful because of our collective commitment to doing what's right. We work to serve our customers and to support our franchisees with great marketing efforts, monthly information seminars and a whole waffle bowl of traffic-building fun. 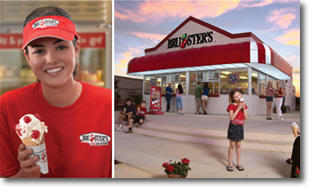 Known traditionally for our stand-alone stores, Bruster's has also evolved with our franchisees and, most importantly with our customers. We've recently enhanced our franchise model to include not only real-estate ownership, but also concepts including drive-thru, in-line, 'co-branded' stores with Nathan's® Famous hot dogs as well as satellite locations. If you have a passion for doing things right, then Bruster's Real Ice Cream is for you. Each and every day, we take the time to feature nearly 40 flavors of real ice cream, and delicious waffle cones and bowls on site! Not to mention our absolutely stunning parfaits made with fresh sorbet and real vanilla ice cream. Milkshakes, sundaes and a special kids menu – we have it all. And it's all the best. To top off the huge selection of fresh-made ice cream, most of our stores – either stand-alone or in-line – are constructed with up to eight serving windows to treat our customers quickly and efficiently. And, since our parking lot is our dining room – seating is almost limitless. So, if you're ready for a fun, exciting and rewarding entrepreneurial experience balanced with the safety and efficiencies of a turnkey system that offers the absolute best products customers crave, welcome to the Bruster's Real Ice Cream family. If you're tired of the day-to-day company grind and like the idea of being your own boss while utilizing a proven, turnkey system, Bruster's Real Ice Cream is for you. With 20 years of experience in building successful franchises in the right places with the right people – Bruster's Real Ice Cream is a delicious choice. From New Hampshire to Texas, Bruster's Real Ice Cream treats millions of satisfied customers every year with fresh-made ice cream – consistently making the brand one of the nation's leading franchises as ranked by Entrepreneur Magazine. Please note this franchise is currently not accepting inquiries from WA,OR,CA,AK,HI,MT,ID,NV,AZ,WY,UT,CO,NM,ND,SD,NE,KS,OK,MN,IA,MO,IL,WI or from outside the United States. 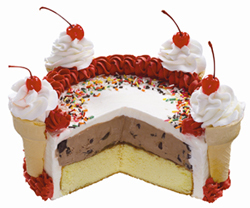 Click on Request Information for FREE info on how to open a Brusters Real Ice Cream franchise today! Please Note: This Bruster's Real Ice Cream franchise opportunity and other franchise business opportunities, businesses and franchises for sale on this web site are not to be considered as an "offering", "franchise offering", suggestion or recommendation by Franchise Leader™. This advertisement depends entirely on the truthfulness of the information provided by our advertisers which includes, but is not limited to, franchisers, franchise brokers, franchise consultants and business brokers. Franchise Leader™ recommends that you consult a lawyer, financial consultant, accountant or professional advisor before buying a franchise or business opportunity or any type of business. By using this form or any part of our website, you have agreed to all terms and conditions of Franchise Leader™. Please review our Terms & Conditions for more information.